Mr Adnan Alam, Assistant Director (Monitoring & Evaluation (M&E)), SAARC Development Fund (SDF) visited PASTIC on 29 August 2018 regarding monitoring of SDF funded Project entitled “Networking and Capacity Building of Women Entrepreneurs (NCBWESC) in SAARC Countries”. The Project Financial Agreement (PFA) was signed on 23 November 2017 between SDF Bhutan and PASTIC. 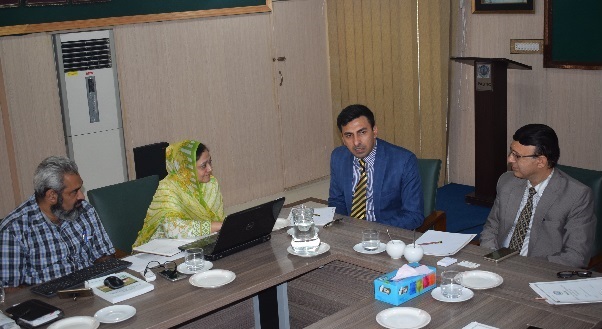 During meeting Prof Dr Muhammad Akram Shaikh DG PASTIC gave a brief overview regarding PASTIC contribution in R&D based Socio-economic development of the country through its various anticipatory and responsive S&T information services. Later on Dr. Saima Tanveer Additional Director (STI)/Project Director delivered a detailed presentation on various project activities carried out by Lead Implementing Agency (LIA) PASTIC and other Implementing Agencies (IAs) from the SAARC member states. Dr. Tanveer in her presentation also highlighted the deficiencies felt by PASTIC as LIA in the implementation of the project on the part of the IAs. The queries of PASTIC regarding head wise calculation of funds for Quarterly Disbursement Funds Request by LIA/IAs and two quarters delay in project implementation were also pointed out in the presentation. Afterwards, during discussion Mr Adnan Alam Assistant Director (M&E) SDF reviewed the procedural mechanisms adopted by PASTIC for managing project activities including mode of Women SMEs data collection in Pakistan and from other member states, out sourcing of web portal development, external audit of project etc. He also clarified PASTIC queries regarding budget calculations for each quarter, processing time at SDF and release of funds. Mr Alam suggested PASTIC to seek out for media review of the project to evaluate fulfillment of project objectives. He also proposed that PASTIC should have to monitor the project activities through monthly and quarterly Skype meetings with all the IAs, secondly, the quarterly work plans of all the IAs should come to PASTIC (being LIA) and a cumulative work plan will be submitted to SDF by the LIA (PASTIC) and this should be ensured by the SDF. After the meeting Mr. Adnan was taken for a round of PASTIC building and the room identified for Project Control Room. DG PASTIC DR. Akram Shaikh , Mr Adnan Alam Assistant Director (M&E) SDF, Dr. Saima Tanveer Project Director and Mr. Saifullah Azeem Project Coordinator during SDF Project monitoring at PASTIC. 29 Aug, 2018.